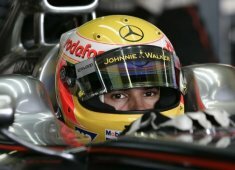 McLaren Mercedes F1 Team driver Lewis Hamilton declared to press agency 'Reuters' that everything is cool between him and Ferrari's Fernando Alonso after the incident at the European Grand Prix at Valencia last week. Fernando Alonso was in a Spanish fury after Lewis Hmailton illegitimately overtook the Safety Car. Hamilton finished the race second, while Alonso, who was stuck behind the SC only crossed the line in 9th place.